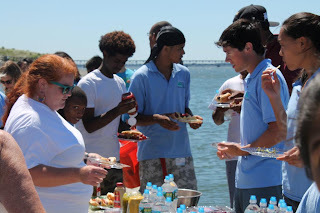 Save the Harbor wouldn't be what it is without it's wonderful staff members and this years celebration to honor them with a fun day out in Boston Harbor was a total success! This year was a continuous day of fun as we set sail at 10:15am for Spectacle Island. 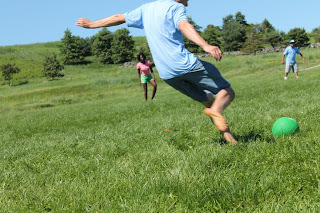 As soon as we made landfall, several of the more athletic staffers walked up the hill and organized a game of kickball. The rest of us hit the beach and took a refreshing swim in the wonderfully clean Boston Harbor. We all worked up quite an appetite for the lunch, which is more like a feast, that Patty Foley and Bruce Berman prepared. After lunch the fun continued at the beach and there was another very competitive kickball game, thankfully with no serious injuries. Every year, Bruce and Patty organize a delightful afternoon on Spectacle Island complete with food, fun, and smiles. 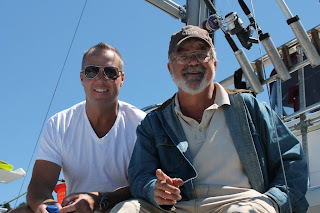 When Bruce and Patty first started doing "Staff Day" in 2000, there were only 14 staff members who could all fit on Bruce and Patty's boat, Veranda. Now, there's 42 staffers who all have to come out on a much larger boat, courtesy of Boston Harbor Cruises. 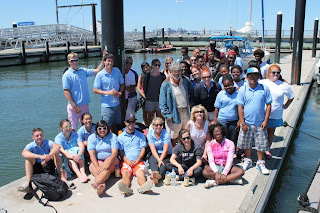 I'm sure we will need to have a much larger boat by next year, as Save the Harbor is a growing non-profit and will be a part of more persons' lives.